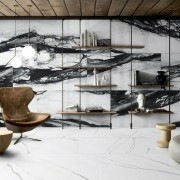 An absolutely stunning large format calacatta inspired glazed porcelain with deep black veining on a fresh white base. 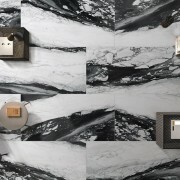 This tile is unbelievably gorgeous with a smooth satin finish that feels luxurious and indulging. Suitable for both interior floors and walls in residential spaces. Timeless appeal and loads of wow factor.